The Southeast Asian state of Myanmar has recently become the epicentre of an expanding humanitarian crisis. But because the current government of Myanmar is headed by a regime favoured by American and European interests, little attention and even less action has been given to the conflict. At least 65,000 Rohingya have fled to Bangladesh from Myanmar – a third of them over the past week – since the army launched a crackdown in the north of Rakhine state. The figure, released by the UN, marks a sharp escalation in the numbers fleeing a military campaign which rights groups say has been marred by abuses so severe they could amount to crimes against humanity. The stories have cast a pall over the young government of Aung San Suu Kyi, with mainly Muslim Malaysia being especially critical. Myanmar’s government has said the claims of abuse are fabricated and launched a special commission to investigate the allegations. 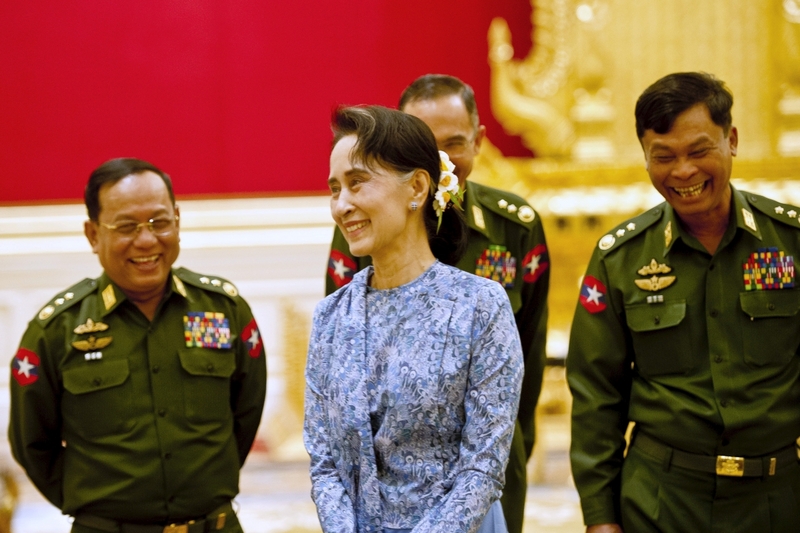 However, anyone at all familiar with Myanmar’s recent history and the nature of the current government’s support base knows that the unfolding tragedy among the Rohingya minority was not only predictable, but with Aung San Suu Kyi coming to power, inevitable. The fact that Suu Kyi’s political party came to power on a decades-long tsunami of US and European cash and political support, despite US-European knowledge of Suu Kyi’s supporters harbouring racist, even genocidal intentions toward the Rohingya, makes the West at the very least partially responsible for the current crisis. The Guardian would also link the violence against the Rohingya to what it calls, “hardline Buddhist monk Wirathu,” in the very last paragraph of its article, giving readers little explanation as to just how prominent a role both Wirathu and his saffron-clad followers have played both in bringing Suu Kyi to power and persecuting the Rohingya with genocidal violence. Such lies of omission are common throughout the Western media indicating a systematic attempt to conceal the true nature of Suu Kyi and her followers. In fact, so contradictory is the image the Western media has built up for Suu Kyi, a Nobel Peace Prize laureate, and the reality of her political movement’s violence, that many are unable to accept the truth even when evidence finally becomes widely known. In 2007, the Western media eagerly reported on what it dubbed the “Saffron Revolution,” a political protest led by Suu Kyi’s political allies, including thousands of monks wearing their saffron-coloured robes. But these same activist groups, including various monk “associations” have systematically been involved in the persecution of and violence against Myanmar’s Rohingya minority. Occasional articles like the UK Independent’s 2012 report titled, “Burma’s monks call for Muslim community to be shunned,” reveal both Myanmar’s “hardline Buddhists” and even activist groups celebrated in the West for “promoting democracy” are involved in persecuting the Rohingya. In a move that has shocked many observers, some monks’ organisations have issued pamphlets telling people not to associate with the Rohingya community, and have blocked humanitarian assistance from reaching them. One leaflet described the Rohingya as “cruel by nature” and claimed it had “plans to exterminate” other ethnic groups. It is difficult to discern what then, the Western media means by “democracy activist” when such “activists” openly display racism, bigotry, discrimination, and support a growing conflict that involves both calls for genocide, and violence aimed at carrying out genocide. The 88 Generation Students group has for years repeatedly weighed in on the Rohingya conflict, backing calls to deny them citizenship, voting rights and even basic human rights. Not only has the US and UK substantially funded and backed Suu Kyi’s political party, but ministers within her government have been trained by US-funded programmes, including Myanmar’s current Minister of Information Pe Myint. The NED (National Endowment for Democracy) is both funded and directed by the US Congress and the US State Department. In essence, Myanmar’s current Minister of Information and the lies his ministry tells on a daily basis, particularly in regards to his government’s brutality toward the Rohingya, has been made possible in part by US government funding and support. The fact that the Western media is still stepping around Suu Kyi and her supporters’ role in the violence against the Rohingya, indicates that support is still being provided. It appears that the plight of the Rohingya will, if anything, only be further exploited to deepen the West’s influence over Myanmar’s current government. While human rights abuses real or imagined have been used to justify entire wars waged by Western military forces elsewhere, very real abuses in Myanmar are being carefully spun to protect the very government and its support base responsible for carrying them out. Such transparent hypocrisy exposes Western foreign policy as entirely predicated on opportunism and self-interest rather than any actual principle. Many times, as is the case in Myanmar, such opportunism and self-interest find themselves trampling such principles entirely.